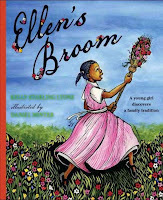 Each year, I especially look forward to the announcements of the Coretta Scott King Award, the Pura Belpre Award and many others that celebrate the diversity of readers in our libraries. 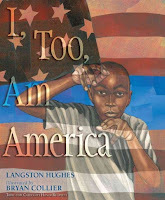 At my school library in Berkeley, we share books that reflect many different perspectives. These awards help us to find the best books from authors of color to share with our students. Here this year's Coretta Scott King Award winners. I will continue posting other award roundups in the next few days. This collection of biographies is stunningly written. 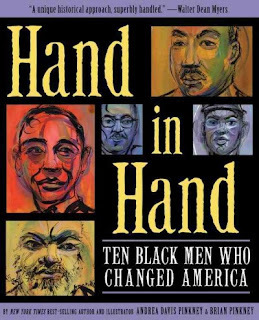 Andrea Davis Pinkney writes with conviction and song in her voice, as she sure-fastedly shows readers many reasons why we admire these black men. I am reading the biography of Benjamin Banneker aloud to my class right now, and they are mesmerized - so impressed by Banneker's accomplishments, but also soaking in Pinkney's language. Collier's stirring illustrations blend watercolors with collage, to create a picture book layered with symbolism that blends the historical with the modern. Collier uses Hughes' poem to honor the Pullman porters. I was particularly struck by how Collier layers symbolism throughout the illustrations, explaining this in his note at the end. 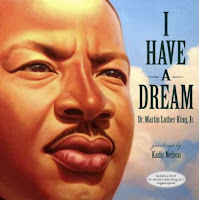 I Have a Dream: Martin Luther King, Jr.
Each one of these books is so very special. Spend the time to seek them out and share them with the children in your life. Emerson 2nd graders have **loved** reading and thinking about which picture book they would award with the 2013 Caldecott Medal. This project is really deepening their ability to articulate how pictures contribute to an overall story. 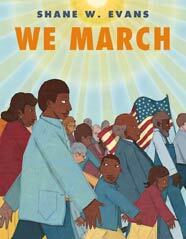 In library language, we call this "visual literacy" - the ability to interpret and make meaning from illustrations. 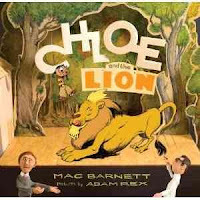 Here are four more of our favorite picture books from 2012. Our students love Extra Yarn more and more with each reading. Even though the artwork is subdued, they respond to Annabelle's creative spirit, to her generosity and to her tenacious refusal to sell her precious box to the archduke. 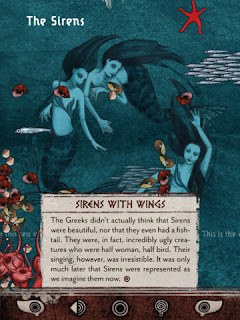 They love the surprising twists of this story, and the way that the illustrations add to the visual surprises. 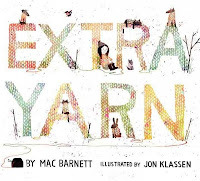 The notice that the illustrations help make the pacing and details are perfect; in particular, the love the wordless pages near the end, as readers need to guess what is happening to the box of yarn. 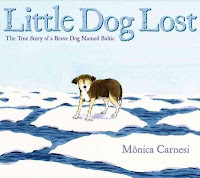 Children have really responded to this true story of a little dog who was stuck on an ice flow in Poland’s Vistula River, and rescued after drifting for two days on the open sea. Was it just because our students adore little dogs, or do the illustrations really add to this? After a hearty debate, our students definitely think Carnesi's illustrations are distinguished, making the story "pop", helping them connect to the dog and understand how he felt. Carnesi creates tension as one thing goes wrong after another. She creates empathy without overdoing the emotions. In fact, today's class voted this as their winner! 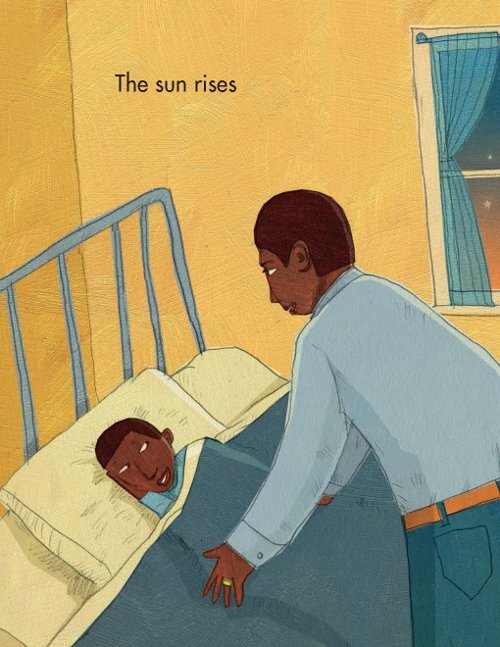 We'll see if the Caldecott Committee notices this sweet, quiet story - we sure hope so. On the surface, this is a book about just one color; but as our students quickly realized, Seeger makes readers appreciate just how many variations there are for a single color. 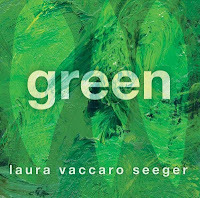 Students loved Seeger's inventive descriptions of different shades of green, from forest green to sea-green to khaki green. We talked about the texture of the oil paint and the canvas that shows on each page. 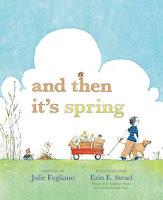 And they loved the twist near then end when Seeger adds yet another layer with “all green / never green / no green / forever green.” This is certainly a book where the illustrations extend it far beyond its simple words, making reader think about color in new and different ways. 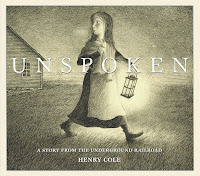 While this book took my breath away, it did not stay with our 2nd grade readers quite the same way when compared to other favorites in our Mock Caldecott discussions. When we read it together, the students responded to the details in each illustration, noticing what different animals were doing on each spread. They liked the muted colors and the building of tension as the little boy waited and waited for spring. But I think this quiet book might be too slow and subdued for their tastes. But I wonder if the Caldecott Committee might appreciate the way Stead's artwork builds the themes and anticipation in this lovely story. Many thanks to the publishers for supporting our Mock Caldecott unit: Penguin, Harper Collins and Macmillan. If you make a purchase using the Amazon links on this site, a small portion goes to Great Kid Books (at no cost to you!). Thank you for your support. 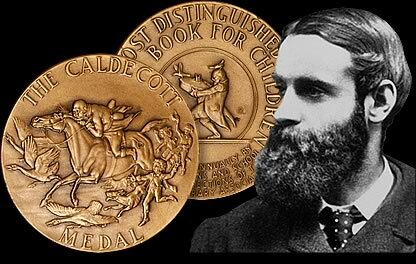 Each year, a group of librarians gather together to discuss the best picture books of the year, awarding the Caldecott Medal to the artist of the "most distinguished" American picture book for children. This year's Caldecott winners will be announced on Monday, January 28th - we are very excited to see which artists are recognized with this great honor! 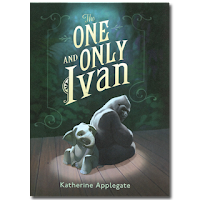 My students were charmed by this sweet book, loving the rhythm of the story, the unexpected items selected to focus on each color, and the rich, saturated color of each illustration. On each page, they noticed the details in Wolff's illustrations, as well as the balance between large figures and spaces and small detailed illustrations. Lieder's photographs took my students' breath away. As one student said, "They make the images pop out." The brilliant color, the compositions, the contrast between blurred backgrounds and crystal clear animals, and the incredible details in each photograph are astounding. The photographs complement Frost's words and extend them, giving readers fascinating images to contemplate on each page. Students also remarked about the pacing, the way that the photographs allow you to read the poem slowly, savoring each image. Flemings rhyming text and Rohmann's colorful illustrations absolutely captivated my students. They chanted along with me, saying the choral, "Ribbit-oops! Ribbit-oops!" and "Oh, no!" right in time. But best of all, they loved the way Rohmann changed his perspective with each page, showing just enough of each scene to draw you right in. They loved the playfulness of having to find the tiger - spotting his claws wrapping around the tree, or his tail poking out from the bushes. Rohmann creates his illustrations using relief prints with the reduction method (see here for an explanation of what that means), and you can see some fascinating examples of his work in progress at the wonderful blog Seven Impossible Things Before Breakfast. 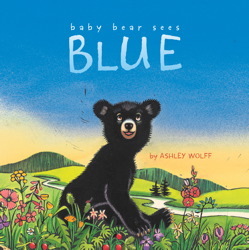 While Betsy Bird over at Fuse #8 wonders whether problems with the perspective will cause this trouble, my students and I would agree with Ed Spicer (see the comments in Betsy's post) that the animals in the hole can sense the tiger prowling outside the hole without having to see him. 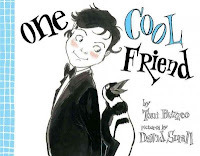 Rohmann's illustrations add to the humor, energy and pacing of this wonderful book. This is one we will read again and again. Ed Young's expressive collages hooked my students from the cover, with those big eyes peering out from the black disguise. 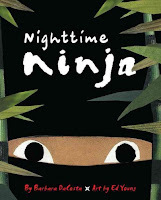 My second graders loved the twists and surprises that Young reveals in his illustrations, as he slowly hints that the Ninja might be a young boy with an active imagination. My students would agree with the Horn Book, which writes, "Young’s art, however, perfectly pairs with the minimal text. His cut-paper and cloth illustrations do the heavy lifting here, imbuing the tale with mystery, beauty, and emotion." The illustrations create tension and pacing that captivates young readers, making them want to turn to this book for multiple readings. 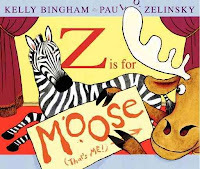 Many thanks to the publishers for sharing and supporting our Mock Caldecott unit: Simon & Schuster, Candlewick, Random House, and Little, Brown. If you make a purchase using the Amazon links on this site, a small portion goes to Great Kid Books (at no cost to you!). Thank you for your support. As we celebrate Martin Luther King, Jr. Day at our school, I love sharing Shane Evans' We March with our youngest students. We March is filled with solemn purpose, hope and determination as it teaches young children about the Civil Rights Movement and the 1963 March on Washington. 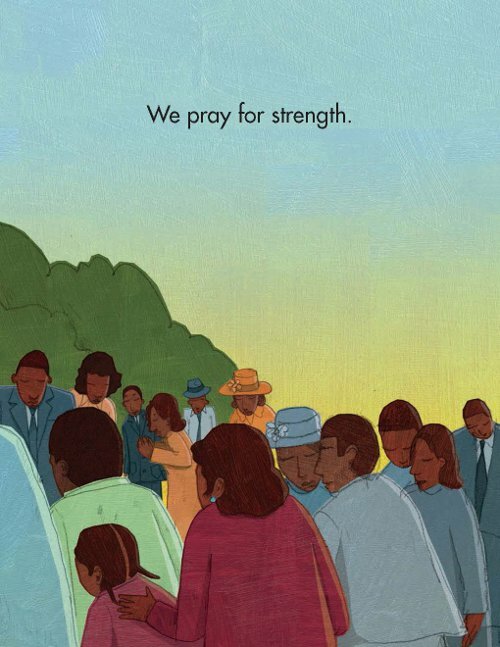 Shane Evans helps young children understand the March on Washington by showing them a family's day as they get ready to join the march. This remarkable event, when more than 250,000 people gathered to protest for better jobs and equal rights, is brought right down to a child's view. A family joins neighbors to pray at their church, paint signs and travel by bus to Washington. They walk and sing and grow tired but “are filled with hope” as they stand together at the Washington Monument to listen to Dr. King speak of dreams and freedom. 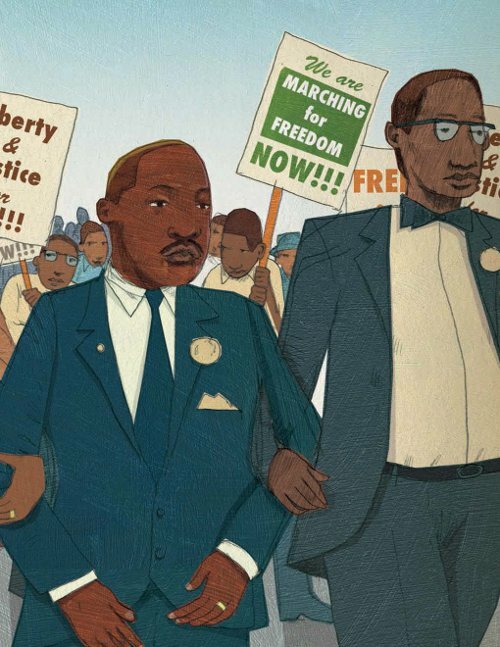 Evans uses very simple, pared down sentences and tells the story through his stirring artwork so that young preschoolers and kindergarteners can grasp the importance of this moment in our history. It reminds us all that the efforts of ordinary people matter. As we talk about celebrating Martin Luther King, Jr. Day with our children and our students, I hope we keep these messages at heart. Each of our contributions can make the world a better place. Shane Evans is truly a remarkable artist. 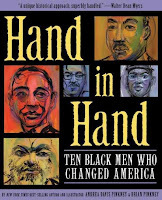 As his friend and collaborator Taye Diggs wrote in the Horn Book, Shane is a “renaissance man. A true artist, in every sense of the word. Illustrator, painter, sculptor, photographer, singer, songwriter, musician, composer…the list goes on. He’s the type of cat who just randomly picks up a guitar, and next thing you know, he’s teaching you how to play.” I had the pleasure of seeing Evans talk at the 2012 Coretta Scott King Awards Breakfast last summer. He played the guitar, sang and inspired a room full of admiring librarians. Images copyright © 2012 by Shane W. Evans. Published by Neal Porter/Roaring Brook Press, New York. 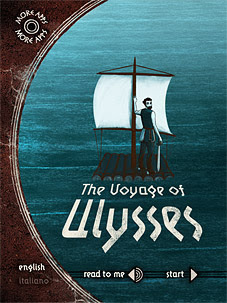 Images used with permission of publisher. The review copy was kindly sent by the publishers, Roaring Brook, an imprint of Macmillan. If you make a purchase using the Amazon links on this site, a small portion goes to Great Kid Books (at no cost to you!). Thank you for your support. 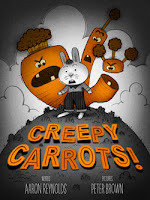 Young children are drawn to picture book apps that combine narration, interactive features and appealing illustrations. But really, it's the story that counts. Does it engage children? Do they want to find out what happens next? Do they want to read it again the next day? 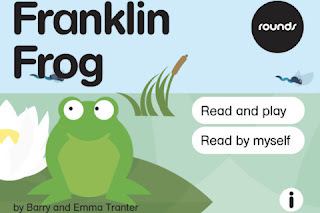 Our students have really enjoyed reading Franklin Frog, the first story in the Rounds series by Nosy Crow. 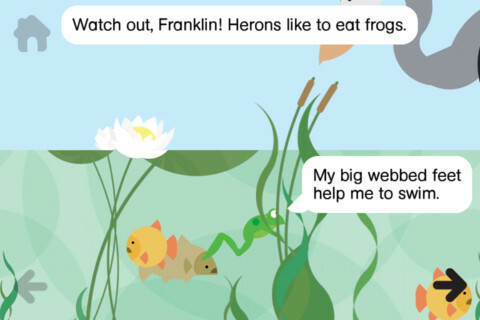 This book app does a beautiful job introducing preschoolers and kindergartners to real facts about frogs, from their habitat to feeding to metamorphosis, through an appealing story about Franklin Frog and his offspring. It draws children into the story, as they guide the frogs with their fingers. Children make the frogs jump, swim, catch flies, avoid predators, find a place to hibernate, croak to attract a mate and more. The Rounds series introduces young children to animals' life cycles from infancy through adulthood, onto reproduction and childrearing. 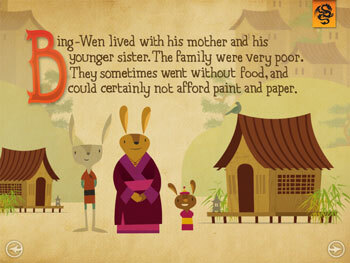 The stories then follow the main characters' children, going round and round again. Here, children first meet Franklin Frog, and then his mate Felicity Frog. From one of their eggs, a new frogspawn hatches and the story begins again following young Frasier Frog. This app always feels like an exploration of how a frog lives, and never feels like a game. The interactions focus on exploring the way frogs move, avoid herons (see below), eat insects and find mates. As the Horn Book review says, this app presents the information in "an accessible way that’s respectful of both its subject and its audience." 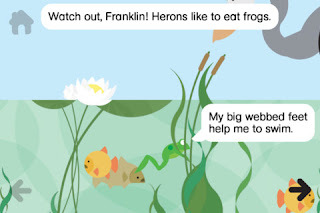 School Library Journal recently included Franklin Frog in their best apps for January 2013. They wrote, "With its simple activities and circular format, this colorful app is bound to keep young children engaged through several frog generations. 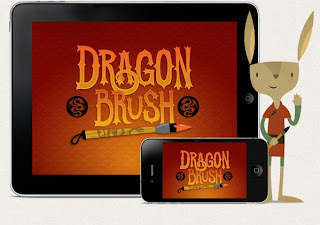 ... A delightful balance between educational and entertaining." 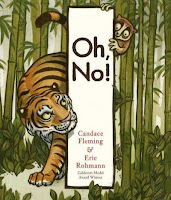 Check out more 2012 Cybils finalists to find great books to read with your kids. The 2012 Cybils winners will be announced on February 14th! 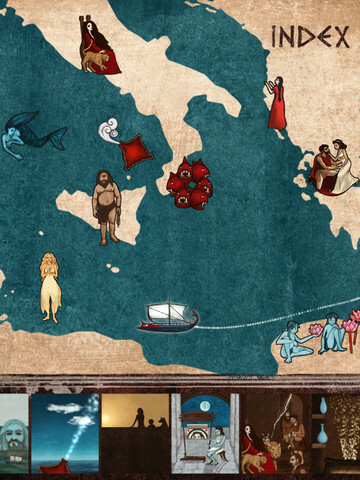 Nonfiction book apps are shining stars in the 2012 Cybils book app finalists. 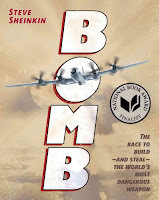 In fact, if you look "Best of 2012" lists from Kirkus Reviews and School Library Journal, you'll find several interesting examples of book apps that share facts and information with young readers. The best of these integrate well written nonfiction text, vibrant full-color photographs and videos, interactive features that help students experiment and engage with the topics, and narration that makes the content accessible for a wide range of children. Mary Kay Carson's Bats! Furry Fliers of the Night has wowed students at Emerson since it was released in January 2012. They love the way it pulls them into the nighttime scene, immersing readers in the world of the bats. Bats! 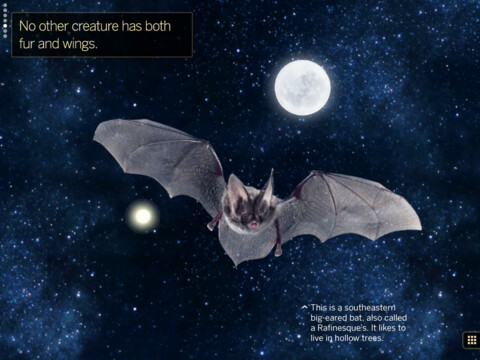 is an original book app written by Mary Kay Carson, a prolific nonfiction author who also wrote The Bat Scientists as part of the Scientists in the Field series. She layers clear text with interesting diagrams, photographs, and interactive features. The diagram on the right highlights the body part as you tap the label. While this seems like a fairly simple step, it reinforces young children's understanding of clear nonfiction text features. The design elements are top-notch, providing just the right amount of zing to keep kids engaged without distracting them at all from the essence of the material. 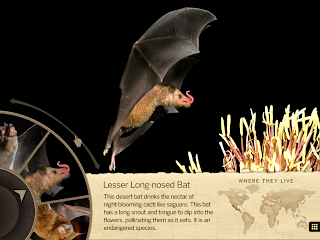 Below you see the "Wheel of Bats" which readers spin to find out more information about different bats. 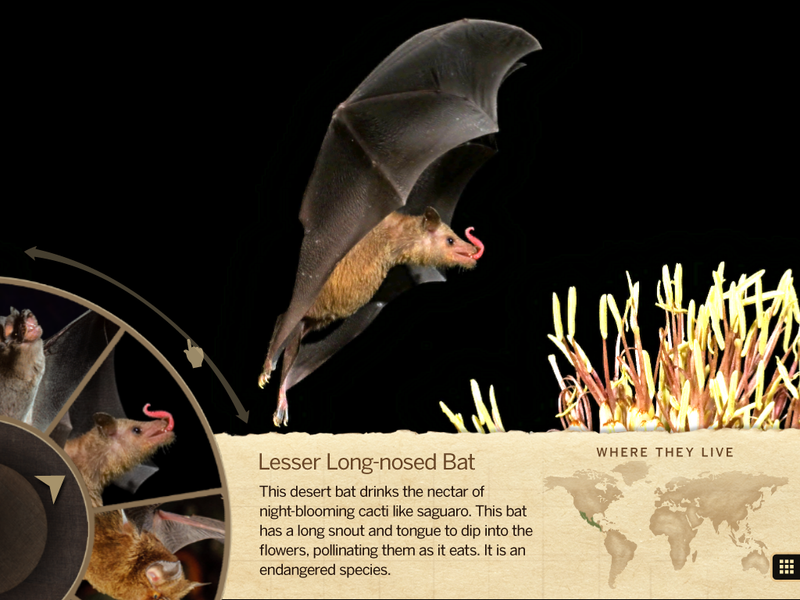 With an effective blend of traditional nonfiction features and innovative interactive elements, Bats! 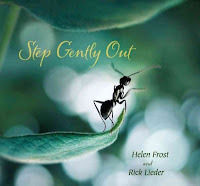 offers young readers many opportunities to learn about these furry nocturnal fliers. 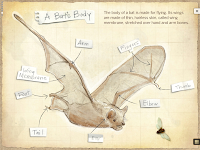 Children will enjoy learning about the physical features, behaviors and habitats of bats through clear text, photographs, captions, diagrams and maps. 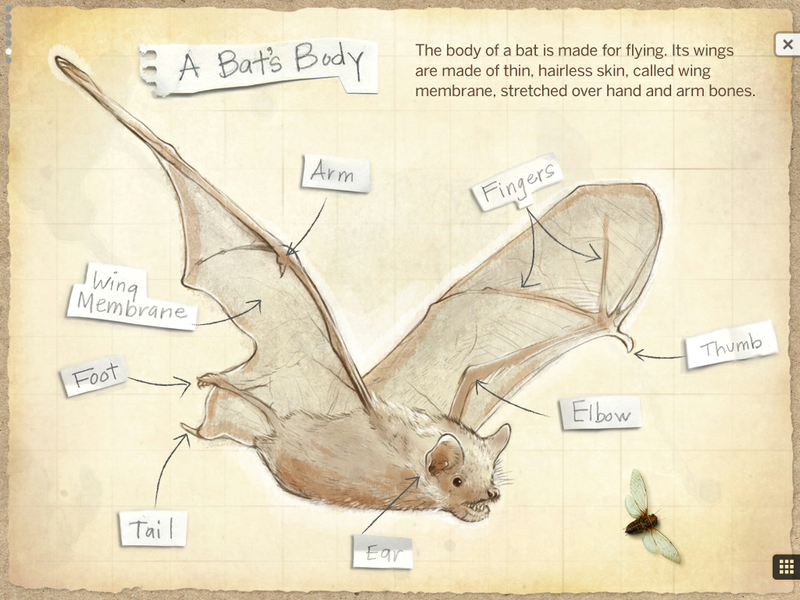 Readers tap diagrams to make wings flap, tilt the iPad to steer a bat in flight, spin the "Wheel of Bats," and search for hidden bats in various habitats. 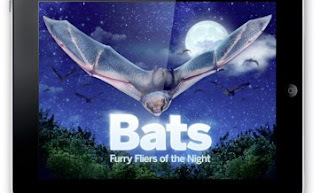 The vivid animation of bats flying in the night sky coupled with sound effects from nature (bat wings flapping, wind howling, water babbling, and bats screeching) give readers the sense they are watching live bats in the wild. 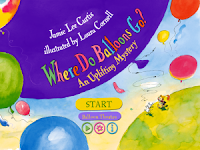 Children will have a ball learning about science in this high quality nonfiction app. As fellow panelist Paula Willey writes on her blog PinkMe, Bats! is "a terrific nonfiction app, with beautiful sharp photos and animations that enhance understanding of the subject." I couldn't agree more.